Is Bitcoin Gearing Up for a Year-End Rally? The oldest and largest cryptocurrency was trading for about $6,000 per coin on Halloween 2017. By the time we got to Christmas, bitcoin was above $19,000 per coin. 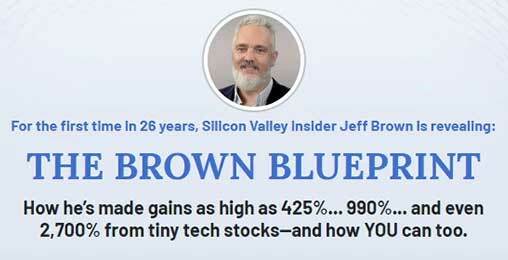 Silicon Valley executive and angel investor Jeff Brown’s tech ideas have given folks the chance to make as much as 100% in 11 days… 130% in 30 days… and even 990% over the long haul. 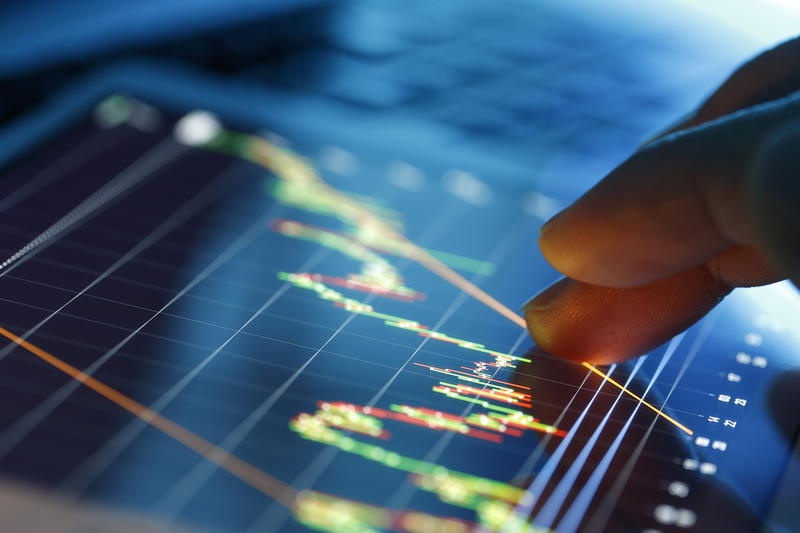 During a free online event this Wednesday, November 7, he’s sharing his “blueprint”… and revealing the names of four stocks on his watchlist. Bitcoin crashed. It gave back all of the gains of the parabolic rally phase. And, for the past few months, bitcoin has been stuck in a relatively tight trading range between $6,300 and $6,600 per coin. But, it looks to me like bitcoin is gearing up for another year-end rally. This chart is forming a tight “consolidating triangle” pattern (the blue lines). Bitcoin is rapidly approaching the apex of the triangle. So, the price is set to break out of the pattern, one way or the other, within the next week or two. All of the technical indicators are in neutral territory. So, they’re not offering any clues on the potential direction of the coming breakout. 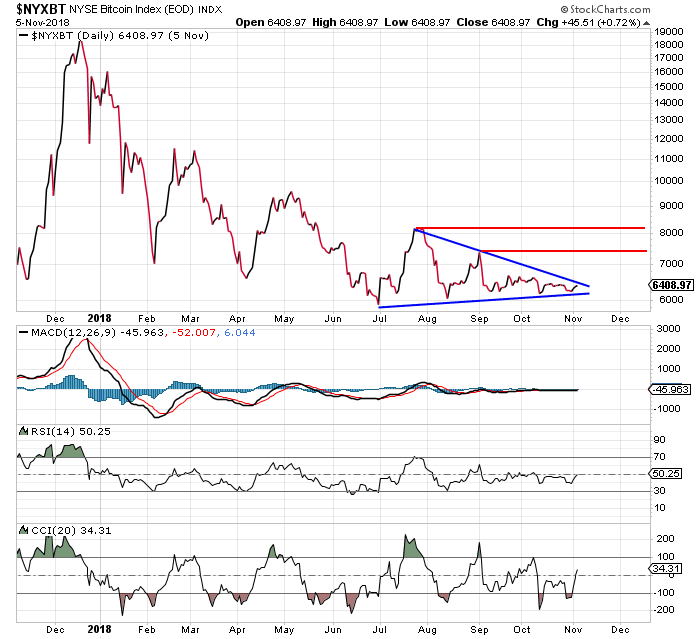 But, to me, this chart looks more bullish than bearish. That’s not going to happen – at least not anytime soon. Parabolic tops – like the one formed on bitcoin last December – tend to mark the top of the price for several years. Think about the parabolic top in silver back in August of 2011, when silver traded up to $49 per ounce. That was seven years ago. And while silver has had many decent rallies over the past few years, it has never come even close to getting back towards the $49 level. What direction do you see bitcoin heading in? What do you think about cryptocurrencies, in general, and do you own any? As always, send any questions, suggestions, or trading stories to [email protected]. Tonight at 8 p.m. 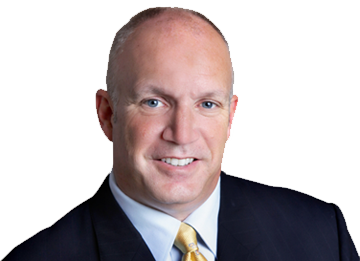 ET, Bonner & Partners’ go-to tech expert Jeff Brown is hosting a free webinar, sharing all the details of the 5G network buildout. This technology is poised to reshape entire industries… and make early investors rich in the process. Don’t miss this free event… you’ll also get four companies on his “5G watchlist” just for attending. Reserve your spot here.